Country music superstar Trace Adkins isn't exactly known for holding back what's on his mind. And if the millions of albums he's sold are any indication, when Trace talks, people listen. Now, in A Personal Stand, Trace Adkins delivers his maverick manifesto on politics, personal responsibility, fame, parenting, being true to yourself, hard work, and the way things ought to be. In his inimitable pull-no-punches style, Trace gives us the state of the union as he sees it, from the lessons of his boyhood in small-town Louisiana to what he's learned headlining concerts around the world. Trace has worked oil rigs in the Gulf of Mexico, been shot in the heart, been inducted into the Grand Ole Opry, and braved perhaps the greatest challenge of all: being the father of five daughters. And shaped by these experiences, he's sounding off.-I'm incredibly frustrated with the state of American politics. If there were a viable third party, I'd seriously consider joining it.-If anybody wonders who the good guys are and who the bad guys are in this world, just look at the way we teach our children as opposed to the way the fundamentalist Muslims teach their children.-Organized labor now exists for the sake of organized labor, not for the workers it once protected.-I believe the easiest way to solve the illegal immigration enforcement problem is to go after the employers who hire illegal aliens.-As a society, we're unwilling to sacrifice our luxuries and our conveniences in order to conserve. We won't change until we're forced to.-The war on terror is like herpes. People can live with it, but it'll flare up from time to time.Brash, ballsy, persuasive, and controversial, A Personal Stand isn't just the story of Trace Adkins's life; it's the story of what life can teach all of us. 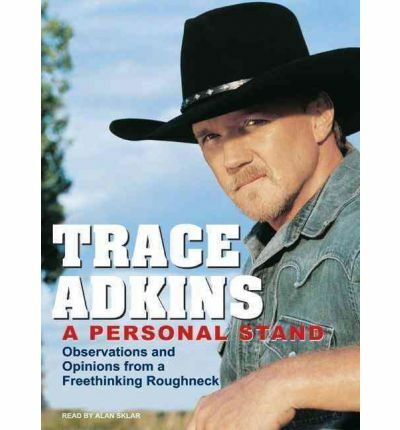 About the Author: Trace Adkins was born Tracy Darrell Adkins in Springhill, Louisiana. He learned to play guitar at an early age and eventually played with the New Commitments. In the early 1990s he performed solo in honky-tonks, and after gaining some fame he moved to Nashville and signed with Capitol Records. He has released seven albums. His most recent, Dangerous Man, debuted at number 1 on the Billboard country chart. A member of the Grand Ole Opry, Trace Adkins has appeared on numerous television shows, including The Tonight Show with Jay Leno, Late Night with Conan O'Brien, Hannity and Colmes, and Politically Incorrect with Bill Maher. He lives in Nashville with his wife and five daughters.ALAN SKLAR has narrated over 75 audiobooks and earned numerous awards for his work. He has also provided the voice for thousands of corporate and medical videos, as well as many radio and TV commercials. He lives with his wife in New York. Note: This Audio Book is in mp3-CD format. This signifies it will only run on a cd player particularly fitted to run mp3-CDs. It as well can be installed onto a home pc and copied over to various mp3 players and played on them.